Here is a shot I took of a bus at the Isle of Man Airport in 1966, I took it at the same time 1966 as the Isle of Man Road Services Leyland Titan posted two weeks ago. As stated on that post I know very little about buses more a railways man so I will leave it to anyone who wants to comment to do so. 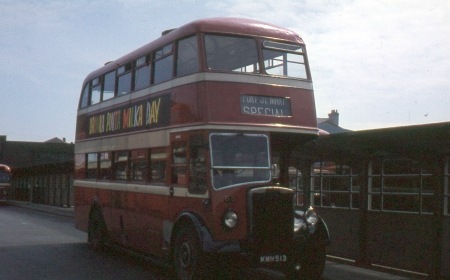 When the Stratford Blue operations were absorbed into the main Midland Red Company in 1971, PMT was able acquire five almost identical Willowbrook bodied Tiger Cubs to the one pictured here. Four were DP, one was bus seated. Originally Stratford Blue 41-45 (2741-2745 AC) they were new in 1959. They were a bit slow compared with the PMTs own AEC Reliance 470s but performed useful work on some of the flatter routes from Stoke and Newcastle Depots and they didn’t suffer from frequent cylinder head gasket failures! The Albion designed five speed constant mesh gearbox was quite a nice unit to handle – but then I didn’t have to work them on One Man Operation for a shift! Yes, Ian, interesting point you make. Despite a general superiority, the AECs had an Achilles heel – the wet-liner engine (AH470 and AH590). Leyland produced two mainstream engines, the 0.600 and the Leyland Comet engine which progressed from 0.350 to 0.375 to 0.400. The Comet engine was small, underpowered and noisy but did it’s job reliably. Regulars know my predilection for AECs but also my, not quite equal, admiration of Leyland (Motors). The wet-liners did a lot of harm to AEC’s erstwhile superb reputation and allowed the Leopard to subsequently overtake them in the market. ‘Not knowing anything about buses’ in my opinion isn’t a good enough reason for not showing an internal shot of such a classic vehicle. Don’t come much better than all Leyland PD2s, but can anyone explain why Isle of Man always had these peculiar off balance upper deck ventilators (ONLY on the near-side)? I never understood that either, but it did make the IOMRS fleet rather distinctive. (I have a feeling I have seen a photo of a similarly equipped PD2 with another operator, but I can’t remember where or with whom). Very nice to see that tidy interior shot too. It reminds me of Barton’s second hand no. 754 (GUT 455) ex-Allens, Mountsorrel, which operated regularly in the early 60s on our route 15 (Ilkeston – Long Eaton – Sawley). Widnes Corporation used the same arrangement which I can only assume was to give upper-deck passengers a choice of the fresh-air treatment by sitting on the nearside or for the more delicate a chance to keep out of the draught by sitting on the offside. I don’t recall the arrangement being used by any other operators and it certainly spoiled the appearance of the vehicles. I would be interested to learn if my assumption is correct. Just clutching at straws, but I wonder if the odd window arrangement could possibly be to avoid a direct "wind tunnel" effect from the offside windscreen and down the staircase, to escape from the platform. Having lived in Widnes in the 70s, Widnes Corporation were not doing their passengers any favours with all the chemical factories in the area! As far as I know it was to do with cost – IoMRS were not known for spending anymore than was absolutely necessary, the same window arrangement continued right through until the last new d/d purchases in 1964, a one pane window was cheaper than an opening hopper or slider. Equally saloon heaters were largely not provided, nor were grabrails. Whilst I can’t just recall the grabrail specification on the PD2 shown, other than what is visible on the image, the 1964 batch of PD3s had head height rails only installed above the two lower deck side seats, whilst the sole upright rail, other than on the platform area, was at the top of the stairs. No other grabrails were fitted, which meant conducting – or alighting – the bus whilst on the move err…interesting. I remember the arrival of this and its 17 sisters in 1949, and worked on them as a seasonal conductor 1958-61. I can confirm the Company sought economy in everything; none of its buses had direction indicators, relying instead on a white band on the right sleeve of drivers’ uniforms when stuck out of the cab window. Drivers claimed that when Leyland staff received an order for buses "without this, without that or the other" they would say "It’s that b***** IOM Road Services again". Due to lack of grab rails, on a lively journey I used to press the flat of my hand against the ceiling to keep upright. Nice to see this pic. I’m currently working on similar bus KMN 501 but will restoring it as Liverpool L428 JKB 580. 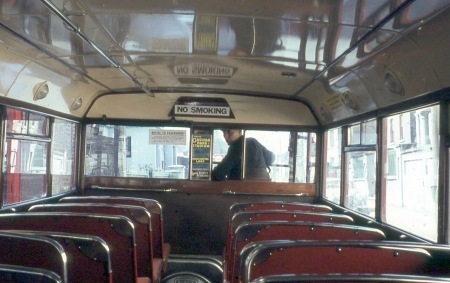 North Western was another all Leyland PD2 operator with the same ventilation arrangement. 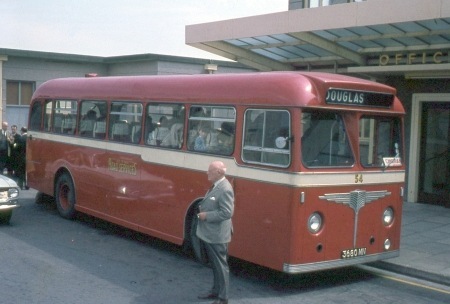 The standard Colin Bailey body throughout its life and various modifications was offered as standard with solid front upper deck windows, the opening vents could be specified as an extra. Many operators bought the standard package but some quickly received complaints of lack of ventilation, especially in the summer when tobacco smoke would add to warmth and the side window ventilators removed little of the fug. They then retrofitted one or two vents. North Western’s examples were lowbridge bodies which made the problem worse and they quickly fitted a nearside vent window, in their case the reason for the location being the offside was occupied by the gangway.